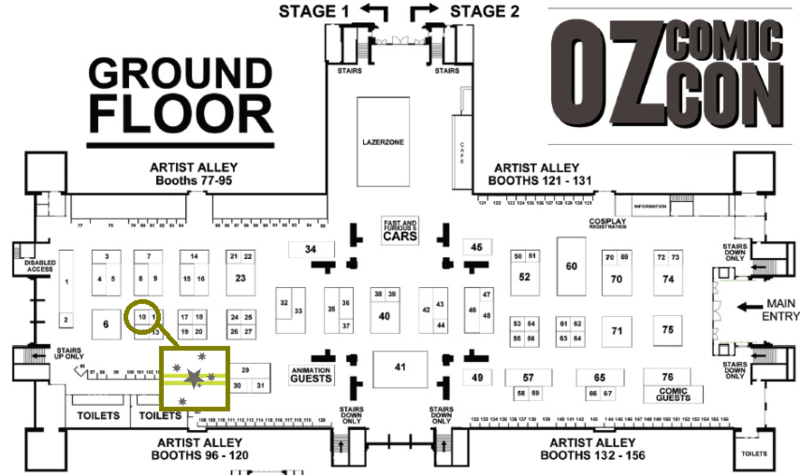 New Melbourne Browncoats, Inc. | Here’s where to find us at Oz Comic Con this weekend! Highlights from the Melbourne “Much Ado About Nothing” Q&A with Kai Cole Firefly Artwork Abounds at Oz Comic Con Melbourne this weekend! Here’s where to find us at Oz Comic Con this weekend! This year we’ve upgraded from a table or two in Artist alley to a BOOTH ON THE MAIN FLOOR!! Wooohooo!! You can find us towards the back of the trading floor, near Jason Palmer (whose work you absolutely must check out). The entire NMB Committee (Jen, Michael, Leanne, Mick & Chris) will be manning the NMB Outfitters store for the weekend and we love meeting our fellow Browncoats (and Whedonites, and folks who are just learning the awesomeness of Joss Whedon)! So don’t be shy, come along and say Hi! We’ve got lots of shiny things for you to buy, with proceeds going to our charities FareShare and Fitted For Work. If you’re a member, make sure you’re wearing your dog tags! Members get 10% off all NMB Outfitters store merchandise sales at Oz Comic Con Melbourne. You should also make sure to visit Sharmill Films in Artist Alley (Table 83, just near Booth 7 & 14) and let them know how much we love them for bringing Much Ado About Nothing to Australia!